Clucking Bell, it's the Four Inns 2019. The many names of the "green thing". Whilst the Cat is away, the Mice will play... El Dude brothers had a smashing weekend whilst Claire Cobley is in Scotland. After munching food and arranging kit, and aggressively being stamped for a £2 entrance fee by the Women's Institute, we made our way to the field of "glory", soon to be "gory" as it was notably warm and close, or as my Nana would have said "clammy". It was quite an assembled field with runners sporting a number of club colours. It was at this point that the race was delayed as the fire engine and ambulance upped sticks and shot off like a bat out of hell. 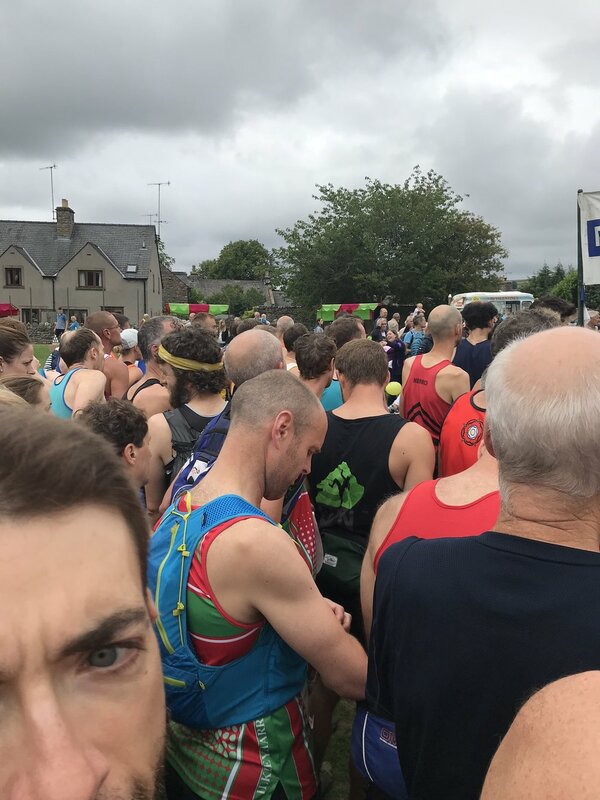 The festival organisers run the race as part of the festival and it was clear it was going to be minimal when adhering to fell running etiquette, with for example the start being a prompt ten second count down after runners were told "we are now getting on with it." How was the start? Everyone went off like the fire engine and ambulance, i.e. like a bat out of hell. It was a fast dash up the high street to dodge startled tourists and shoppers, with need of the pavement at times. I knew it would be fast as the "Gradwell Gopher" had shot off. I have walked many times up Inglebough from Ingleton using the route of the race, the common ascent to Ingleborough North West from Ingleton, via A Pennine Journey, an unusual and pleasantly named route. Well, fell running the route up was not pleasant at a "hoofing it" pace, in what soon became very close heat, with strangely Ingleborough summit shrouded in clag. It was only going to get hotter, and thankfully I'd changed from an Ultimate vest to my old faithful, the Pete Bland bum bag. It's fast paced due to the terrain, with you reaching nearly 2k feet at the summit over a three mile pelt. About half way into the climb, Stu Hutchison the "Hurricane", caught up with me and "cheerfully" said it's hot. Yours truly was mulling over how in the space of a month he was climbing hard over distance in humid heat, having not long run the Kate Burge Sea-to-Summit race on the Isle of Man. At this point Stu soldiered on and the little monkey pulled away ever so slightly, refusing to walk up Ingleborough which then starts to slowly, surreptitiously, and cheekily climb up, with about three false summits. Near the top the Gopher cheerily bobbed down at quite a speed on what is tough rocky terrain with your not being able to use the path due to later runners climbing up. I caught Stu as we turned at the Trig point, with the summit clag bound and very cool indeed, soothing and needed, as we'd not really had a breeze, but all in all strange Yorkshire weather conditions. It was at this point that I took the eye off the ball whilst watching "Hurricane", caught a stone, flew, and ended up in a heap scratched and battered on a leg and arm. It was then a very very fast downhill to chase Stu and other runners with the initial phase very steep and rocky as you avoided runners ascending the summit. A few "hellos" on the way down and it became warm again. Toward the end and about a mile or more from Ingleton I developed a stich from hell and began to drop back, with a slight recovery to pelt it back to the village field, with no sight of Stu; turns out he was a minute ahead, and Gopher a full seven minutes. 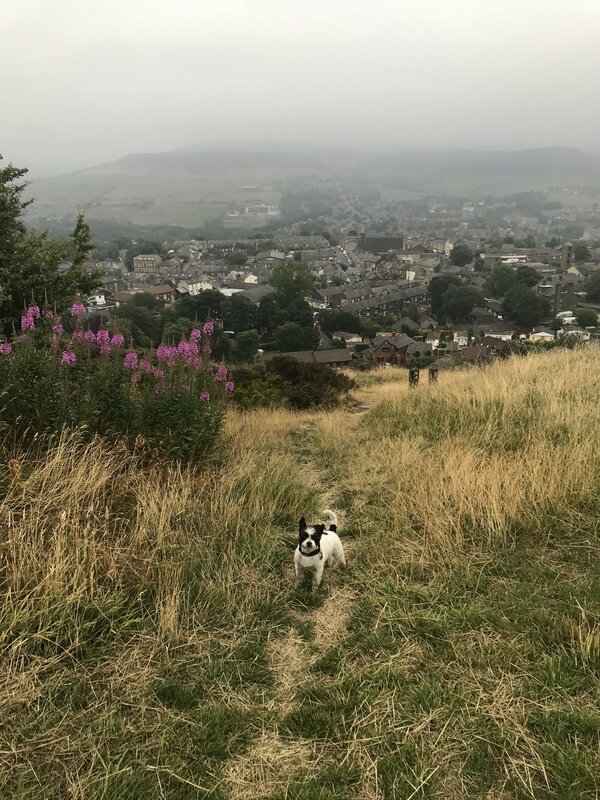 On returning home, there was food, some work, a shower, and then off out to support Gareth Evan's 2.5 loops of the Oldham Ultra at 100 miles, with 10k feet of climb. Around 3.30am I met Gareth, Mark, Chris, and some French Bird that would not leave Ted alone. The support ended being around five hours with a walk/run to Hartshead Pike before saying goodbye to the lads and heading home. Ted and I had walked 15 miles in the early hours of Sunday. 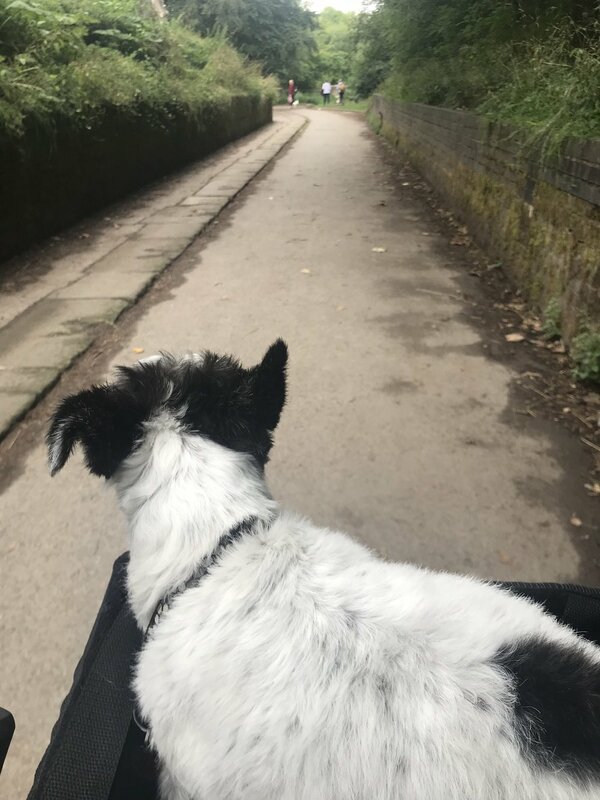 To finish off the weekend's fun, Ted and I took a leisurely ten mile bike ride to collect the car utilising the "Tedmobile" with sausages at Daisy Nook café for fuel.